One of the best strategies that contributed greatly to the success of the Illuminati in subduing the world to its knees is their effective conscription of the best minds in every field of the era. Not only that their controversial programs were legitimized but were also emboldened in manner that is beyond popular understanding. The World Health Organization itself is engaged, together with Baxter and Novartis, in the willful attempt to exterminate US citizens through H1N1, and has been financing bioweapons research which brought us HIV-AIDS. 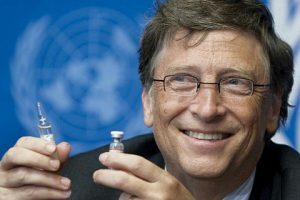 Through the Bill & Belinda Gates Foundation, Bill Gates has been promoting massive vaccinations under the guise of philanthropy in conjunction with the World Health Organization’s immunization programs. 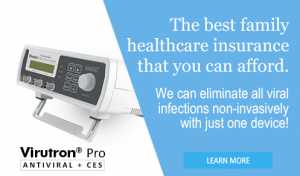 The Center for Disease Control owns the patent for weaponized Ebola virus, and all of the aforementioned entities are engaged in media fear mongering campaign to force all of us to vaccinate. Vaccines, until now, are tainted with mercury, formaldehyde, human fetus and live “attenuated” viruses it is advertized to protect us from. Due to its sheer ugliness, the disclosure on Eugenics can only be done in a gradual manner, but the neutralization of its ardent proponent must be swift. A state fair exhibit to help educate the public in eugenics. 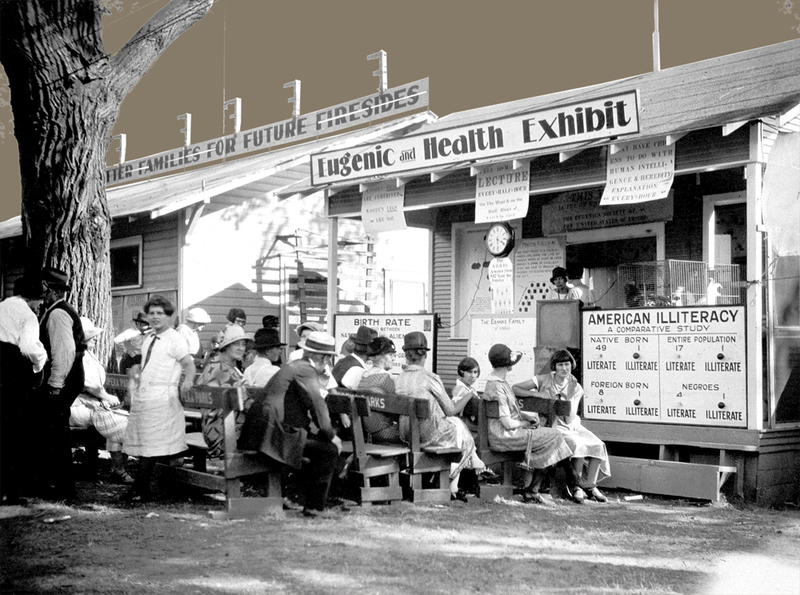 During the early decades of the twentieth century, eugenics was both mainstream and widespread—as this photo from a state fair in the early-to-mid-1920s demonstrates. 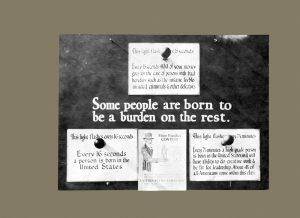 For readers today, it is almost impossible to browse through the eugenics literature from before World War II without hearing intimations of Auschwitz in every line. It takes a continual effort to keep in mind that they did not know about the Holocaust then. When one early enthusiast declared that eugenics “is going to be a purifying conflagration some day,” no one understood how horrifically prophetic those words would later sound. And partly it’s because, having grown up Irish and Italian, I am aware that my people also entertain notions of our magnificence. Other ethnic groups do the same, though they are generally not so foolish, or so accustomed to power, as to issue scientific pronouncements on the topic to the less fortunate. The truth is that all humans favor in-groups, starting with the family, and we disparage those we perceive as outsiders. Treating this as only the outlaw impulse of eugenicists and Nazis is a convenient way of overlooking a hateful tendency in us all. These eugenicists also felt disturbingly familiar in other ways. They weren’t sinister characters out of some darkly lighted noir film about Nazi sympathizers, but environmentalists, peace activists, fitness buffs, healthy-living enthusiasts, inventors, and family men. If Madison Grant had not been such an ardent racist and so closely tied to Nazi genocide, he might be remembered today as one of America’s greatest conservationists. “Among his many accomplishments,” writes Jonathan P. Spiro in his recent biography, Defending the Master Race, “Grant preserved the California redwoods, saved the American bison from extinction, founded the Bronx Zoo, fought for strict gun-control laws, built the Bronx River Parkway,” and helped create Glacier, Denali, and Everglades National Parks. Entirely apart from his reputation as an economist, Fisher enjoyed an idyllic American existence. He lived with his wife Margaret and their three children in a big house on the crest of Prospect Street, with a music room, a library, and “a 40-foot living room with a large, sunny bay window,” as their son Irving recalled in his memoir, My Father Irving Fisher. A health enthusiast at home as well as in public, Fisher disdained cane sugar, tea, coffee, alcohol, tobacco, and bleached white flour. He often jogged in shorts around the neighborhood and liked to ride a bicycle to his classes on the Yale campus. One of his books was titled How to Live. His various crusades required a platoon of busy assistants. So Fisher built out from the basement of the family home onto the sloping ground in back, eventually creating ten work rooms and, young Irving recalled, a “hidden beehive of activity below decks.” The office equipment included one of Fisher’s own inventions, an index card filing system that made the first line of each card visible at a glance. With his wife’s money, he turned it into a thriving business. When the company was bought out—it would become part of the Sperry Rand corporation—Fisher capitalized on his new wealth by buying stock on margin. By the late 1920s, he and Margaret had a fortune of $10 million. “Unfortunately,” Yale economist Ray B. Westerfield agreed, “his eagerness to promote his cause sometimes had a bad influence on his scientific attitude. It distorted his judgment.” This was never more nakedly obvious than in October 1929, when Fisher’s enthusiasm for stocks as a long-term investment led him to pronounce that the market had arrived at “a permanently high plateau.” The great Wall Street crash hit shortly after, and it turned America’s greatest economist into a national laughingstock, incidentally leaving the family fortune in ruins. But his almost religious conversion to eugenics, not long after, turned all that upside down. Two decades after his own recovery, Fisher was denouncing “hygiene to help the less fit” as “misapplied hygiene” and “distinctly dysgenic. . . . Schools for tubercular children give them better air and care than normal school children receive.” He seemed to have forgotten that he was once among those who, by his own harsh standard, deserved to have their heads held fast in the lion’s mouth. Other Yale eugenicists also allowed their work to be distorted by the cause. Robert Yerkes is remembered today as a primatologist and the founder of the Yerkes National Primate Research Center at Emory University. But when he came to Yale in 1924, as a professor in the new field of psychobiology, he was better known for developing the first national program of intelligence testing—a program that provided an ostensibly scientific basis for the fight against immigration in the early 1920s. Yerkes and a team of like-minded scholars had designed the test at the start of World War I, as a means “for the classification of men in order that they may be properly placed in the military service.” By war’s end, the US military had administered it to 1.7 million recruits. According to the test, the average native-born white American male had a mental age of 13. But his foreign-born counterparts were morons (a label coined by the eugenicists, from the Greek for “foolish”), with an average mental age barely over 11. Fisher’s friend, Madison Grant, likewise wrote about “being literally driven off the streets of New York City by the swarms of Polish Jews.” Grant became the leading advocate for state laws mandating involuntary sterilization of the “unfit” and banning interracial marriage. He also persuaded Virginia to discard its practice of granting the privileges of a white person to anyone with 15 white great-grandparents; state officials were soon sniffing out and harassing anyone with even “one drop” of non-white blood. The Immigration Act of 1924—with quotas based on the 1890 census—became law that May. Congress had been “hoodwinked” by the eugenicists, Representative Emanuel Celler complained, with the result that total immigration was cut in half, and immigration from targeted countries like Italy by as much as 90 percent. The law would later become a factor in preventing Jewish refugees from escaping Nazi persecution. As early as 1933, the New York Times was noting that if you changed Madison Grant’s “Nordic” to “Aryan,” his arguments sounded much like “recent pronouncements and proceedings in Germany.” Even so, eugenicists put Grant’s name forward four times in those years for an honorary doctorate from Yale. University officials gave his backers the polite brush-off. 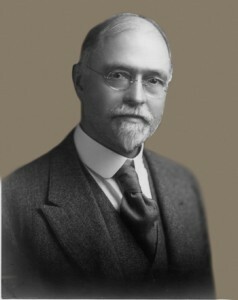 Fisher survived World War II, dying in 1947 at the age of 80. His major causes by then were warding off deflation and requiring banks to hold larger reserves against their deposits, proposals that remain relevant in the post–Lehman Brothers era. We do not know how Fisher, Yerkes, Huntington, or other eugenicists responded to the discovery of Auschwitz, Buchenwald, and other centers of racial hygiene. No doubt they were horrified. Grant’s Passing of the Great Race would turn up once more after the war, at Nuremberg. Hitler’s personal physician Karl Brandt had been charged with brutal medical experiments and murder in the concentration camps. His lawyers introduced Grant’s book into evidence in his defense, arguing that the Nazis had merely done what prominent American scholars had advocated. Brandt was found guilty and sentenced to death. Irving Fisher and the other Yale eugenicists would no doubt rejoice that the university’s germ plasm is still so highly valued—at up to ten times the price for other colleges. But if they looked more carefully at the evidence, they would discover that these highly desirable donors are now often the grandsons and granddaughters of the very immigrants they once worked so hard to eliminate. Next post: kWh Smart Meters are Carcinogenic, too!